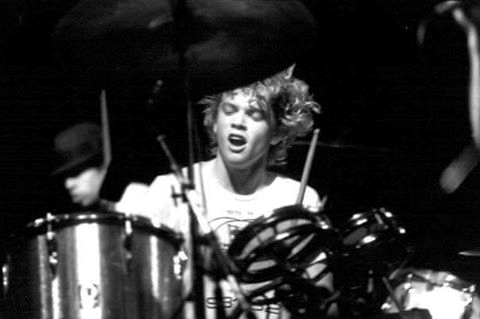 Drums have had an important role in my life. My older brother started taking lessons when he was quite young and early on shone with a boundless energy when he played. He was very creative and was clearly driven to develop his own unique and complex style. I secretly wished to be the kind of musician he was, to dance to my own drum as he did. He played in two bands in the eighties. One was Kinetic Ideals, who opened for such groups as The Spoons, Teardrop Explodes and Echo and the Bunnymen, impressing audiences with their distinctive and powerful sound. He later played in Breeding Ground, contributing to their hit song Reunion. On June 23rd I lost my brother after his long struggle with complex health issues. I dedicate this collection of books to the memory of Jonathan Davies – son, brother, father, artist, drummer, beautiful dreamer. I hope he has found peace at last. Bouchard, David and Shelley Willier. The Drum Calls Softly. Calgary: Red Deer Press, 2008. Written in both English and Cree, Bouchard’s poem honours the circle and all that it symbolizes. There is the round dance and how it connects people to each other, and to the higher spirit of Mother Earth that exists in everything and resides in everyone. There is the circle of our days and the blessings that the earth brings with each one. There is the turning of the seasons and there is birth and death which are part of the circle of our lives. The drum beat which is consistent throughout the poem resonates with the sacredness of traditions and the importance of maintaining them through changing times. The exquisite paintings of Jim Poitras capture the beauty of nature, speak to our relationship with and dependence upon nature, and why we should respect nature. The book includes a bilingual CD, with a reading of the poem as well as singing and drumming by Northern Cree. For readers wishing to join the author’s celebration of Native Canadian life and beliefs, and to experience the round dance at the beating heart of the poem, this beautiful books is one that will teach us much, and will be treasured. Engle’s lyrical poem is inspired by the story of Millo Castro Zaldarriaga, a young girl who “broke Cuba’s traditional taboo against female drummers.” With the beautiful illustrations of Rafael López rendered in acrylic paint on wood board, readers are drawn into the creative world of a young girl who refused to give up her dream of playing the drums. Though many held on to the idea that only boys should play drums, eventually her father found a teacher who helped her to build on the skills she gained independently by listening to and imitating sounds from musicians, nature, carnivals, and from her own imagination. With practise she was able to join the all-girl dance band formed by her sisters and see her drumming bring joy to listeners wherever she played. 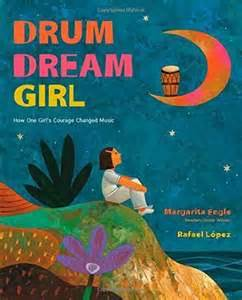 This gorgeous book ends with the message that “girls should always be allowed to play drums and both boys and girls should feel free to dream.” Above all else, Drum Dream Girl speaks to the importance and power of dreams. Greenwood, Mark. Drummer Boy of John John. New York: Lee & Low, 2012. 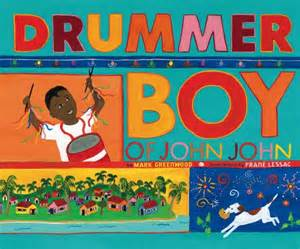 Brought to life with Frané Lessac’s dazzling illustrations in gouache, Greenwood’s story is inspired by the life of Winston “Spree” Simon, a pioneer in the development of the steel drum (pan). Set in Trinidad, the story is about groups of young musicians and their preparation for participation in the Carnival parade. Readers will meet chac-chac players, a tamboo bamboo band, shango drummers and a bottle and spoon orchestra. They will hear all the marvelous sounds like shoush-shap, click clack, jingle jangle and chucka boom bam! And they will meet Winston and learn how he discovered ways to make music with junk yard tins, cans, pots and pans that would win his group the top prize from the Roti King. This beautiful book is full of the joyful colours, sounds and flavours of Carnival, and will make readers want to learn more about Winston “Spree” Simon, marvelous maker of steel drums! Guidone, Thea. Drum City. Berkeley: Tricycle Press, 2010. Harris, Pamela K. Drums. Chanhassen, MN: Child’s World, 2000, c2001. 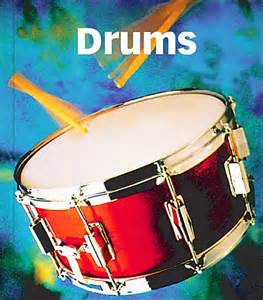 Drums is a non-fiction book divided into short chapters that cover a variety of topics including: rhythm instruments, how drums are made, and beating a drum. 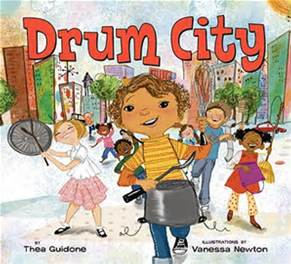 Illustrated with photographs of how drums are used in different cultures and circumstances, this informative book will provide a basic introduction for children curious to learn more. Drums can be quiet or loud, they are used to create rhythms and help other instruments to keep time. Drums can imitate sounds in nature, accompany dances, send messages or tell stories. There are many kinds of drums such as taiko, bongo, tambourine, kettledrum, djembe and more. Harris’ book is a wonderful invitation into the world of drums. This entry was posted in Activities to Enjoy, Arts Books for Children, Children's Music, Curriculum in Early Childhood, Music and Movement, Poetry, Teacher Education, Uncategorized and tagged books about drums, books about musical instruments, Breeding Ground, girl drummers, Jonathan Davies, kinds of drums, Kinetic Ideals, Native Canadian drumming, poems about drums, round dance, steel pan. Bookmark the permalink. What a wonderful tribute to your brother. I am sure he is looking down on you with grace and force, like drummers do. My brother and husband are musicians and I am not… ???? Take care my friend and don’t be a stranger. Same number, same email address, same FB name. Amazing books. Lovely ideas and very inspirational for our schoolage group. Thx Angelique.